Today's card is for Challenge #35 going on over at the Peachy Keen Challenge Blog. 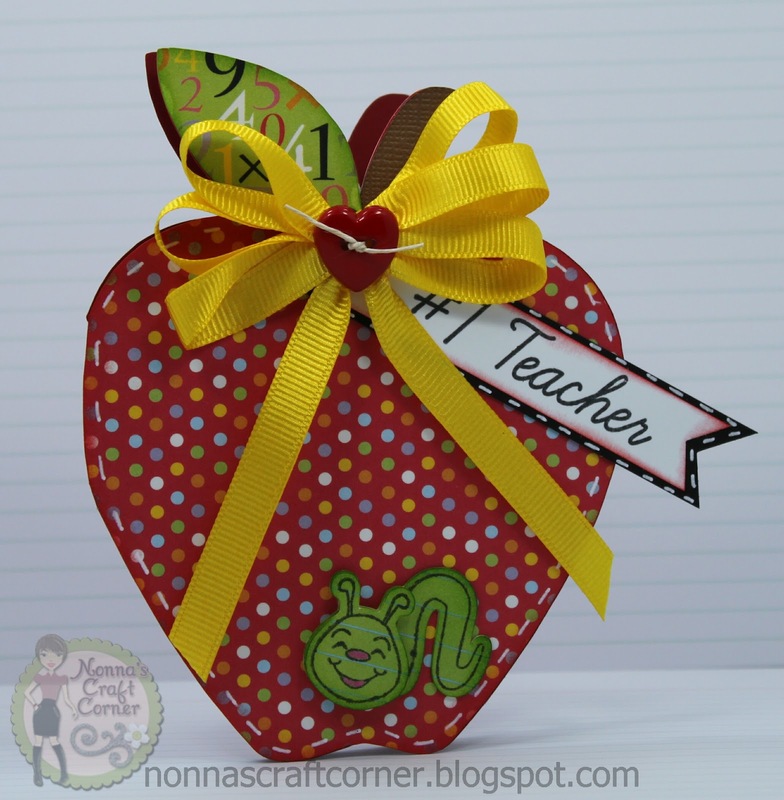 This week's challenge is called "Just Cards - Teacher". Talk about perfect timing - Emma (my granddaughter) just asked me to make a card for her new 2nd grade teacher! * I got the fun, apple shaped card from the Silhouette Online Store. * Papers are from the DCWV paper stack "Grade School"
* The sentiment and that adorable little worm are from the Peachy Keen August Stamp set. * Some bright yellow ribbon and sweet button finish up this cute little card. I hope Emma's teacher likes her card (of course, it has to pass inspection with Emma first)! I may be MIA for the next few days - tomorrow morning I begin Phase 2 of my "Dental Implant Saga"! The doctor will be screwing a titanium rod into my newly grafted bone - yikes! He assures me that it will be an easier procedure than having the tooth extracted....I say...we'll see. Hopefully it will be a piece of cake and I'll be happily blogging again in no time! Hope to see you soon! Tanya, I wish you to live through this as painless as possible. Hate to think you'll be in pain. Just sent you a couple of new crocheted embellishments. The apple card is so cute. LOve it. You do awesome job with your bows, I need to get a lesson from you. Cute worm and button. Great job! Hope to see you back soon! Lovely card! I keep saying to myself that I'm going to make some shaped cards, and thanks for your inspiration! 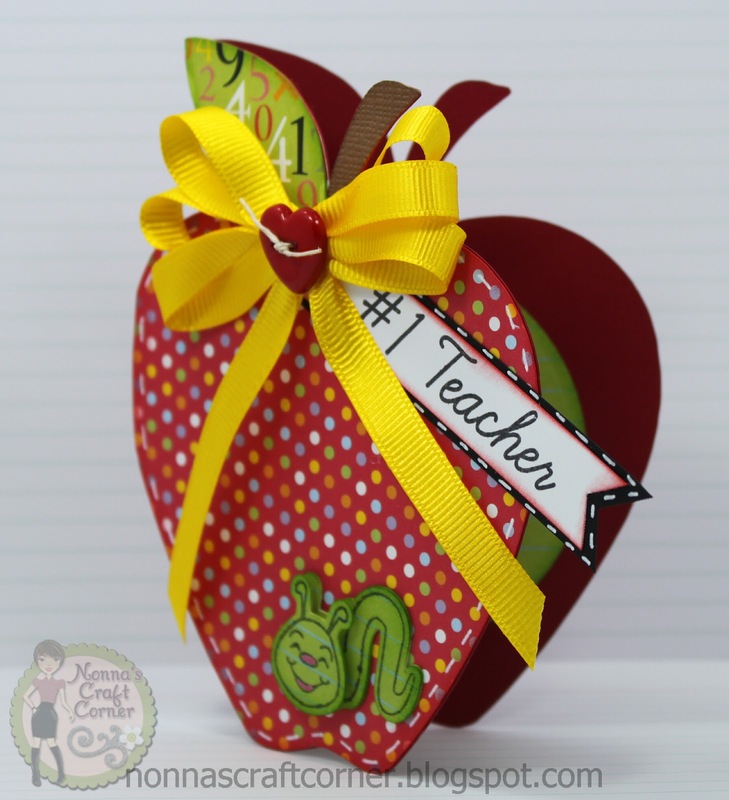 Love your apple shaped card! And I bet Emma does, too! That little worm is just adorable. Beautiful card, love that little worm. Such a yummy looking card. Love the paper and the way you tied the ribbon super cute! Adorable! I absolutely love the ribbon! Hopefully your dental work will be as painless as possible! Tanya ~ OMG! I think this is ADORABLE! LOVE the papers you chose to go with apple card! The stamps and sentiment are just the PERFECT choice too! Well so is that FABULOUS bow ~ WOW! I have to say little Miss Emma is one lucky little girl! OMG ~ I hope your procedure goes well! I will be thinking of you! Hugs!!! Darling apple card... Hope all goes well with your teeth. :) And thank you so much for posting this card at Peachy Keen's Card Challenge. this is soooo adorable !! I LOVE that bow with the heart button, great addition to the apple ☺ awesome job ! Thanks for joining us at Peachy Keen this week!!! Look at that adorable worm! Love it! Tanya, That's adorable. Love the prints and that cute little worm. The yellow ribbon is perfect. Good luck with your implant. Que lindo! O detalhe do bichinho fez toda a diferença.. ficou uma graça!